Phoenix Energy, renewable energy solution provider, reduces over 1000 tons of CO2 emissions with EcoEnergy® biomass heating solution. 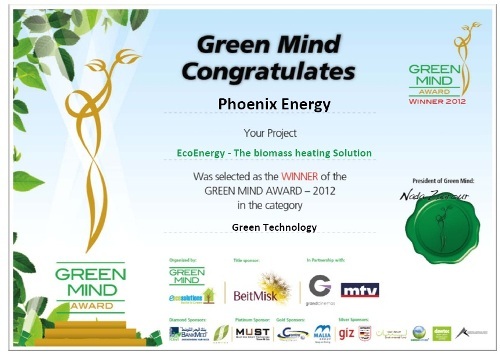 Green Mind, a Lebanese non-governmental organization (NGO), honors Phoenix Energy with the “Green Technology Award” 2012 for encouraging eco-friendly best practices among organizations and individuals. Phoenix Energy’s EcoEnergy®, a renewable and natural heating solution, uses biomass fuels generated from olive husks and reduces the use of Diesel. The Green Mind Award ceremony took place on 31 October 2012, in partnership with e-EcoSolutions, International sustainability consulting company. The ceremony was held during a Gala dinner at the ROYAL Pavillion at Biel, in Beirut, Lebanon. Interested parties can watch the “Gala Night” on MTV, a Lebanese television broadcasting channel, on 16 November 2012 starting 10 pm. Since 2008, Phoenix Energy developed a biomass heating solution using locally generated agricultural waste – olive husk – that can be consumed for domestic, commercial and industrial heating applications. Phoenix Energy created a practical solution for the consumer, as well as a convenient and user-friendly product ensuring the continuous availability of bio-fuel. Till date, Phoenix Energy has installed a total of 3000 kW of biomass heating capacity, saving more than $400,000 USD annually in fuel expenses. For installed applications, the project return on investment (ROI) approximately ranges from 1-3 years.